Goodreads Time Travel Group Giveaway begins today, March 1, 2014! Welcome to the final post in the scavenger hunt for the Goodreads Time Travel Group giveaway for Quest of the Hybrid! The final password is: TIME TRAVEL. Enter all three passwords in the comment section at the bottom for this blog and you will be entered in the drawing to give away 5 copies of Quest of the Hybrid (mobi or epub). For a special surprise, the first three episodes of the Aurora Conspiracy prequel series are available to download for free at Amazon. They want to kill us...only she can save us! The clock ticks down for 19-year-old Jesse Proctor as she embarks on a quest to discover the truth behind her mother’s disappearance into a windmill 10 years before--the very windmill conspiracy theorists believe an alien met fate with in 1897 in Aurora, Texas. Desperate to find answers, she uncovers an enigma--a dimension portal, which opens the doorway to some of the most mysterious places in the universe including: the Bermuda Triangle, the Pyramids of Giza and Atlantis. Could it also lead her to the love of her life? After Jesse meets Aurelius, an alien from Planet Erebus, she discovers a secret that will throw her into the middle of an age-old war with the Celphians, who desire to extinguish the hybrid-infested human race. Danger and mayhem await them at every turn. To make matters worse, her mother is being held captive on Planet Celphi. 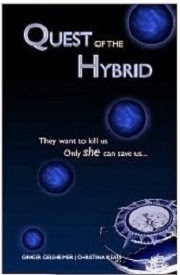 Quest of the Hybrid is the first book in the Aurora Conspiracy Trilogy. Formerly titled Aurora Conspiracy: The Story Didn’t End with a Crash…The Epic Journey Began! We listened to our readers and have refreshed the entire novel with new cover and title, more polish and all new scenes. Hi Julia! You have been chosen as a winner of a digital copy of Quest of the Hybrid! I can send it to you in mobi, epub or pdf file. Just let me know which you prefer! The passwords are COMPASS, ATLANTIS and TIME TRAVEL. Hmm, sounds verra interesting! Hi Brigette! You have been chosen as a winner of a digital copy of Quest of the Hybrid! I can send it to you in mobi, epub or pdf file. Just let me know which you prefer! COMPASS, ATLANTIS and TIME TRAVEL. Looks like a series that my son woyld enjoy too. Hi Suz! Thank you for playing my scavenger hunt game. You are entered for the drawing. You also receive a free digital copy of Crash Landing, the first episode in the Aurora Conspiracy Prequel Series. Would you prefer a mobi epub file? Some other file? Thanks! Hi Suz! You have been chosen as a winner of a digital copy of Quest of the Hybrid! I can send it to you in mobi, epub or pdf file. Just let me know which you prefer! Saw the contest on Goodreads Time Travel Group. Passwords are: COMPASS, ATLANTIS, and TIME TRAVEL. Looks like an interesting story as it combines two of my interests, time travel and UFOs and therefore know of the 1897 Texas event. :) Thanks for playing in my scavenger hunt, grumpus! You are entered in the drawing for Quest of the Hybrid. You also get a free digital copy of Crash Landing. Do you prefer epub or mobi? Or some other file type? Hi Grumpus! You have been chosen as the winner of the paperback for Quest of the Hybrid! Can you send me your information privately, so that I can gift you the book from Amazon? I have been playing with the Rapid Reader (RapidReader.com) and would like to have a .txt file if possible to use in conjunction with that application. If that's not possible, whatever format I can use for my Kindle. Looking forward to reading Crash Landing. Thanks! Hi! We have another surprise for those of you that have made it this far in the scavenger hunt! The first 3 episodes of the Aurora Conspiracy Prequel Series can be downloaded for free at any of these links! Smashwords at http://www.smashwords.com/books/view/410826 Google Play at https://play.google.com/store/books/details/Ginger_Gelsheimer_Crash_Landing_Aurora_Conspiracy_?id=WjDmAgAAQBAJ&hl=en and B&N at http://www.barnesandnoble.com/s/crash-landing-ginger?store=allproducts&keyword=crash+landing+ginger. Thank you Ginger and Christina! I look forward to reading Crash Landing and I hope you the best with your re-launch! Thanks for being willing to offer up your book as a giveaway in the time travel group...been fun! Thank you for having us Lincoln...and you are officially entered! Hi Lincoln! You have been chosen as a winner of a digital copy of Quest of the Hybrid! I can send it to you in mobi, epub or pdf file. Just let me know which you prefer! An extra surprise has been added to the blog! Sometimes you need a new dress!